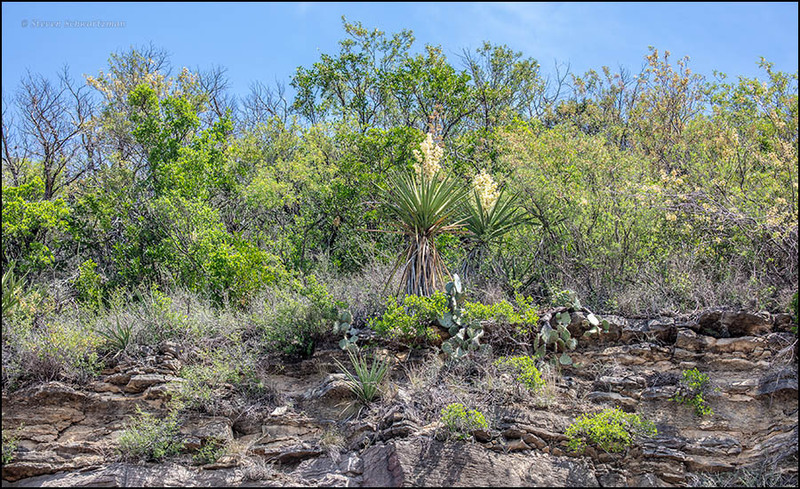 On my latest visit to the Willow City loop, I discovered the steep hills at the north end of the loop just covered with blooming yucca and prickly pear. Between the angle of the light and the distance, I couldn’t get even one decent photo, but it was a sight to see. This is a particularly nice view of those plants. In its way, it’s just as attractive as any combination of bluebonnets and paintbrush, and it certainly is typical of the interesting mix of plants I found in that part of the world. It’s frustrating, isn’t it, to find something you want to photograph but not be able to because the light isn’t good, or you’re blocked from getting close enough, or some obstacle stands in your line of sight, etc. As you say, at least you got to see yucca flowering in hilly terrain. Fortunately I had good light. On the other hand, when I stopped at the same place four years ago, there had been enough rain that spring for bluebonnets to join the yuccas at the top of the cliff. The combinations of wildflowers have appealed to me for a long time. With 100 species you have 5050 possible combinations, and that’s taking them just two at a time. These are common both in Florida and in P.R.. I have one in my blog but it’s called Yucca flaccida, and I just found out now that ‘flaccida’ is also called ‘weak-leaf yucca’, because obviously the leaf tends to bend. This one in your image has very erect leaves. They are beautiful flowers. Would you consider this a dry zone? I looked it up: that area is in hardiness zone 8a and gets 29 inches of rain per year, so you might call it semi-arid. I’m surprised that the one you mentioned grows as far north as Massachusetts. It must be a hardy species. I read that also, and was surprised. The USDA map has it in Canada also. I love the BONAP website, but I still consult the USDA simply because it includes P.R., and BONAP doesn’t. Some USDA maps are really outdated, but at least P.R. is included in some of the species. Right. I noticed that BONAP doesn’t include the Caribbean. I see now that the two maps don’t agree on the distribution of Yucca flaccida. I’ve heard about yucca flowers being edible but have never tried eating any, whether raw or cooked. I don’t know if some species are more edible than others. In Costa Rica, did you sample the flowers of more than one yucca species? That gave me a great laugh when I read it last night! Still does; perhaps I’ll pass that along to the family to lighten a tense moment! Let me know what reaction you get, especially if anyone tries putting sautéed onions in ice cream. In the Philippines people eat avocado-flavored ice cream, so maybe sautéed onion ice cream isn’t so far-fetched. that Yucca glauca is the one Yucca species that grows in Montana. Have you seen it near you? I haven’t. Looks like it doesn’t get this far west by a couple of counties. If I do, it won’t be for awhile. We are expecting up to 8 inches of snow on the passes later this week. Ah, yes, April up there is a different world from April down here. Happy snow. It is neither Yucca pallida nor Yucca constricta. It looks like Yucca torreyi, but is it endemic there? Yucca torreyi is native there, but not endemic to that region alone. The USDA map also shows it from there westward across Texas and into southern New Mexico; I suspect it also grows in northern Mexico. It looks just like a Yucca torreyi, but I just do not know the region, or where Yucca torreyi is from. The name makes it seem like it is from Southern California, but I know it is not. However, the USDA website doesn’t show synonymy for Yucca torreyi and Yucca faxoniana. Sounds like botanists still have work to do on this. I learned them as two different specie, with Yucca faxoniana being a bigger and scarier species. 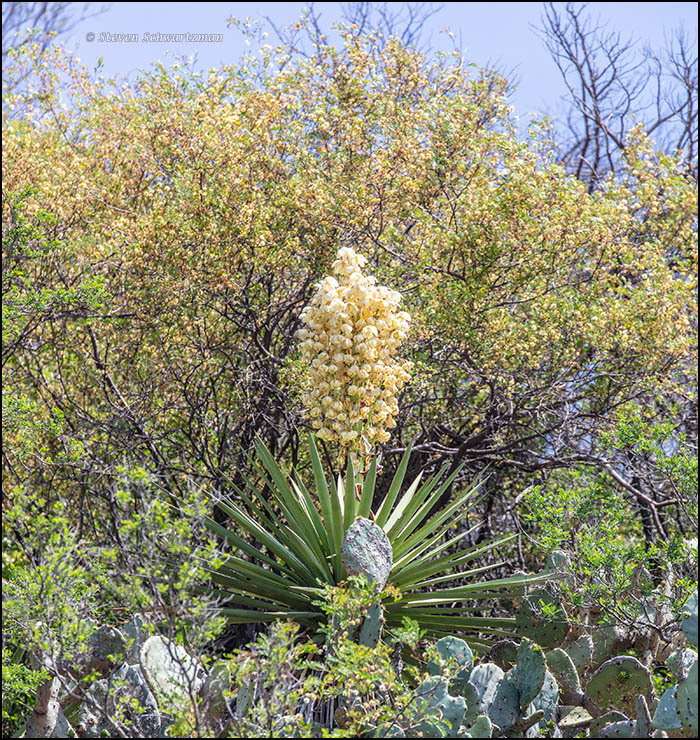 The Yucca torreyi has the distinctive densely cylindrical blooms that yours seems to have. Yucca faxoniana has rounded and more open blooms, and the individual flowers might be a bit bigger. The entire genus of Yucca is so baffling. They all hybridize freely as if they are just subspecies of each other. So many of the specie are supposedly naturally occurring hybrids, and so many of the varieties are considered by by some to be different specie! They might have been the ones who made it so confusing in the first place. A wonderful sight! I’m usually visiting areas where Yucca grows at the wrong time of year to see those big, bold flowers, but it’s an exciting plant any time of year, I think, even as common as it gets in come places. I like the angle, looking up at it, with the Opuntias at hand and the blue sky….beautiful. Ever since I have discovered yuccas, they are among my favorite western plants. I can understand why. It’s good that they abound in the west. I quite like this shot. It looks like quintessential Texas to me. It is quintessential Texas, or at least one of the many quintessential Texases. 🙂 You do live in a wonderfully diverse state. It is: bayous in the east, desert in the west, semi-tropics in the south, high plains in the north. I would think bayous would also describe fox hounds.